The 'Naada Dwaja' (state's flag) in hues of yellow, white and red, has the state's emblem 'Gandaberunda' or the two-headed mythological bird, at its centre. 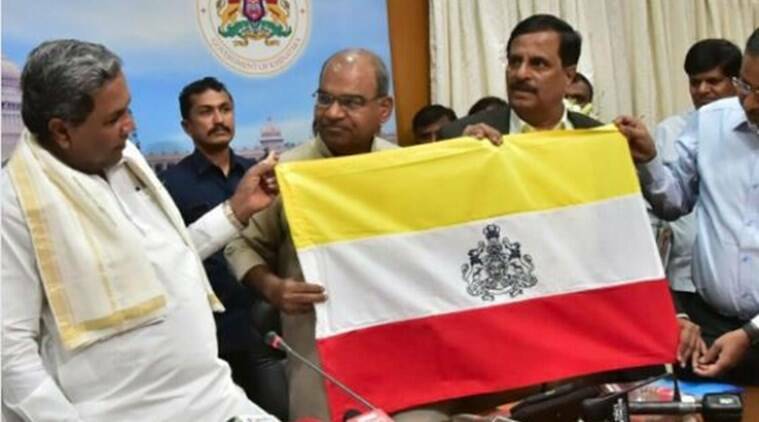 Flagging off the “Kannadiga pride” ahead of the assembly polls, Chief Minister Siddaramaiah on Thursday unveiled the proposed official state flag for Karnataka. The ‘Naada Dwaja’ (state’s flag) in hues of yellow, white and red, has the state’s emblem ‘Gandaberunda’ or the two-headed mythological bird, at its centre. “We have done it today. All (Kannada organisations) have given their approval for it,” he said. Calling the state flag a “sign of Kannadiga pride” and a “historic decision”, he said it would be sent to the central government for approval. Pointing out that the state cannot declare its flag by itself and it requires approval from the Centre, Siddaramaiah said, “So we will immediately send it to the central government. We will also try and impress upon the Centre to give its approval”. Asked whether the Centre will give its approval, he said “the Constitution does not say that the state should not have its flag, so I believe they will agree. As a country has a flag, in the same way in a federal system, there is no bar in the constitution for the state to have its own flag, he said. Also in the federal system the national flag is always supreme and will be above the state flag, he added. A nine-member committee formed by the government had submitted its report on designing a separate flag for the state and providing a legal standing for it on February 5. The government’s move to form the panel had drawn criticism from some quarters, with some comparing it to Jammu Kashmir, which enjoys a special status under Article 370 of the constitution. Pointing that for a long time a discussion about having a state flag was on, Siddaramaiah said the committee after a thorough examination and discussions about legal, historical and constitutional aspects finally came to a decision on the matter. The committee, headed by the principal secretary, Department of Kannada and Culture, was set up in June last year after a representation from noted Kannada writer and journalist Patil Puttappa and social worker Bheemappa Gundappa Gadada. In their representation, the two had requested the government to design a separate flag for ‘Kannada Naadu’ and accord it legal standing. Detailing about the flag design, Siddaramaiah said the tricolour flag has white colour at the middle of yellow and the red flag that “we unofficially use now.” It also has the state’s emblem ‘Gandaberunda’ at the centre, but will not have the inscription ‘Satyameva Jayate, he said’. The unofficial but widely regarded yellow and red ‘Kannada flag’ that is hoisted in the state on November one every year to commemorate the state formation day and used in the form of a scarf by Kannada activists, was designed in the 1960s.